I dropped into the Don Valley Brickworks for Doors Open this week and met with a group of bee-keepers who were there with their bee hive display — It’s an odd feeling to be standing near several people wearing blinding white bee-keeper outfits! You certainly can’t miss them in a crowd. They showed a 2 sided glass box with bees working on the hive inside, so kids and adults alike could see bees doing what bees do – which is buzz around busily amongst their honeycombs. 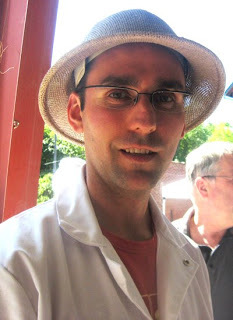 I spoke with Shane Hodge, pictured above, a member of the Toronto Beekeeper’s Co-op. The Co-op keeps bees on one of the roofs of the buildings at the Brickworks, and also some on the roof of the Fairmont Royal York hotel downtown. Read about the posh Royal York bees here. Shane filled me in on some bee info: the fact that bees do, in fact drink, but they need shallow edges to get close to the water without falling in. Their glass bee contraption had an ingenious method of keeping the bees properly hydrated: an upside down jar, with a few holes poked in the lid, which let out enough water (drip by drip) to keep the glass container air just the right amount of moist for the bees. Shane also told me that bees stay buzzing and moving in their hives all winter. (I was suprised. I somehow thought they hibernated, like animals. Not sure what I thought: suspended animation?) To make sure the bees survive our Canadian winters, the hives on the roofs are well insulated before winter freeze-up. 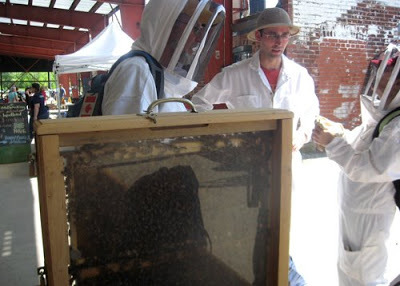 A group of beekeepers from TorontoBees, the beekeeping co-op. Note to self: get one of these outfits to keep black flies at bay! Honey from the co-op hives goes to the members and some is also donated to Foodshare. The combination of the roof garden and the hives on the roof of the Park Plaza apparently gave them a bumper crop of honey last year. 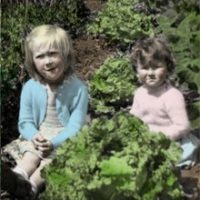 www.TorontoBees.ca will be the url for their new website, which is coming soon. We will keep you posted. Great read. I have hives here in Montana, and am also amazed that they keep buzzing through all the snow and flurry of a northern winter… I will go out and listen, and hear them even in the biggest storms. It's worth pointing out that bees can fly up to a couple of kilometres afield in search of nectar and pollen…that means that we gardeners living near the Don Valley are providing the TBC bees with sustenance.